Chapter 4 (4.1) "The Hunting Lodge" Posted by Director. Chapter 4 (4.1) "The Huntering Lodge"
Remaining quite whilst the other two covered their nervousness with banter, Martel let slip a slight smile; he let his eyes follow the curve of the river's ridge and scan the house, keeping his gaze alert for any of the robber band who might have ventured out to leave their own offering in the spoils beyond the manor. Finally he nodded, offering softly, "Are you as handy with throwing as catching, Master Juggler? Let us circle round beside the river and behind the ridge - me, then you, then Merana at the tail. It will take us close to the house and, with the Divh's Hand, permit us a place to enter the house unobserved"
"I may be Master of catching, but I am the unheralded God of throwing," Smallfeather said, with no small hint of pride. On a good day, he could put a man's eye out at twenty paces with a small pebble. And nodding to Merana, he added, "And aye... very, very sneaky." Was it time to let these two in on his secrets? They seemed to be at a point in time when knowing might prove more advantageous than not. But coming right out and saying so was counter to every precaution he'd ever learned. Ah, well. He could tell them today and still kill them tomorrow if it turned out to be a mistake. Right? With a handful of approaches already on the table it seemed prudent to all three fledgeling Kingsown that it would behove them to get a better look at the lodge. Picking their way along the muddy bank of the creek they rounded a bend that revealed an ill kept natural ford as well as a full view of the hunting lodge. The building was sturdy, though in poor repair. Wrapping around three sides of a small courtyard it consisted of a square, two level building with wings reaching out on two walls. A sagging thatched roof formed a covered hitching post where a rotted out water trough stood. The walls were of rough log, the windows small and the smoke of a fire billowed out of a generous opening in the eaves of the higher section of roof. The courtyard was fenced and dusty though the fence was little more than collapsing wattle and much of its length along the creek had been swept away by flood waters. There was but a single entrance at the rear of the courtyard, and before it two dangerous looking men in rough attire stood in seemingly muted conversation, one with his back to the door and the other directly opposite. The hitching posts were unused, so the men had no mounts at least. That being the case surely if these were the robbers who took the women of Pard then they could not have taken their prisoners further than here. Within the light of a fire radiated through the shutters and some gaps in the walls and thatch and the drone of quieted conversation promised further opposition within. OOC: Happy for the image to accurately reflect the layout, though obviously your angle of approach differs. To get any closer you'll need to be taking stealth tests, as well as perception to watch for any other patrols. Plenty of debris around, but the building isn't in perfect repair. Still, the door's probably the only good entrance unless there's something hidden around the periphery. I assume Smallfeather's leaving his cart a way back up the road? This message was last edited by the GM at 14:26, Tue 14 Aug 2018. Frowning at the sight of the two men, Martel crouched lower and beckoned the other two close to him. His new oath required action and intervention, in spirit, but his prior habits suggestion paths of caution or at least that avoided presumption. He spoke in the softest voice he could, "Confrontation or murder seem our choices, if we truly believe the women to be inside... and whilst making such a choice beneath the eyes of the Divh is fitting, it only increases the pressure of making the right choice...?" - "It is why i offered myself as a distraction. If they believe me alone they should reveal their true intentions soon enough." "It pains me to admit that you are indeed more of a distraction than I," Smallfeather said, considering the layout of the old lodge. "But I feel we may be best served by a large and dramatically inconvenient fire." "If something of value to them is at risk," Smallfeather replied, "then they will need to put the fire out." Men of this sort valued only a few things beyond their own lives. If they had had mounts, nothing distracted like panicked, screaming horses. Sadly, these men had none. Their prisoners were of some value, but the fire was meant to distract them from the prisoners, not draw them in on top of them. The last thing that they valued was anything they required to survive one more day. Their provisions (and their drink, to be sure) would be the only things that they'd give half a dried turd to protect. If their leader had half a brain — said portion probably being the best one might hope for — the crew's provisions were not in the same building as the crew themselves. A band of toughs celebrating a victory could go through enough food for a fortnight before a single sunrise, especially if they had enough drink to keep the revelry going. Unless these bandits were very green, their foodstuffs would be in a remote corner of the lodge. "There," Smallfeather said, pointing to one wing where a half-collapsed wall made the structure unfit for habitation. Prisoners couldn't be kept there, but provisions might. And even if not, it was still attached to the main structure. A fire would still be an immediate threat to the bandits, but also divert their attention from the prisoners. "Best guess, anyway." "Yes, yes, friend Smallfeather, but we will need to find and rescue these villagers, get them away from here. Will it provide enough distraction for that, or will we still have to stand and fight?" He paused, rubbing his eyebrow furiously in thought, and it is clear he is not speaking solely about their current situation, "If we can be two or three steps ahead in this game, we might survive it"
Merana had a doubtful look as the prospect of starting a fire was brought up. She turned to Martel and Smallfeather. - "These women are scared farmwives, not trained rangers. With them in tow we will move slow, and these men will come after us. If they catch us in the forest, they will swarm us while we are occupied with keeping the group together. If they catch us at the farmhouse, they will likely attack under the cover of darkness, and that place is in no shape to fend off an ambush. And if we manage to drop the women off and leave, they'll find themselves back here before dawn. As for us, we would be either killed, caught or, if we manage to evade them, their leader and sponsors would be... invested in keeping our report out of the Earl's ears. In addition, i am still far too aware of this Maikel fellow we know next to nothing about to be comfortable giving him a group of footmen properly motivated to see us harmed." After pausing for a deep breath, which she let out in a sigh, she moved to what to her would be the optimal scenario. - "In order for us to succeed, we would need to deal with these bandits in a more... permanent manner." Though it was worded nicely, the fact of the matter was that she was still proposing killing the bandits. The law was no longer the problem, as Kingsown they had the authority to conduct investigations and defend themselves where necessary, what mattered most now were the will and the skill, however. "She means murder," Smallfeather explained to Martel, in case he missed the nuance. "For the record, I am quite all right with the suggestion. Extremely at ease with it. Possibly even enthusiastically so." Steeling himself, he looked up, "Killing changes a ... person; it is not a deed taken lightly, even when those doing the dying deserve it. Let us dispatch these sentries, with bow and blade, and then we will see about the fire if we need to draw the others out or the women away from them that we may make an end of them to." Glancing back in the direction where the men stood, he offered a plan and a question, "Bow and knife, if we can; if they fail to fall I will take them close enough with sword and sickle? 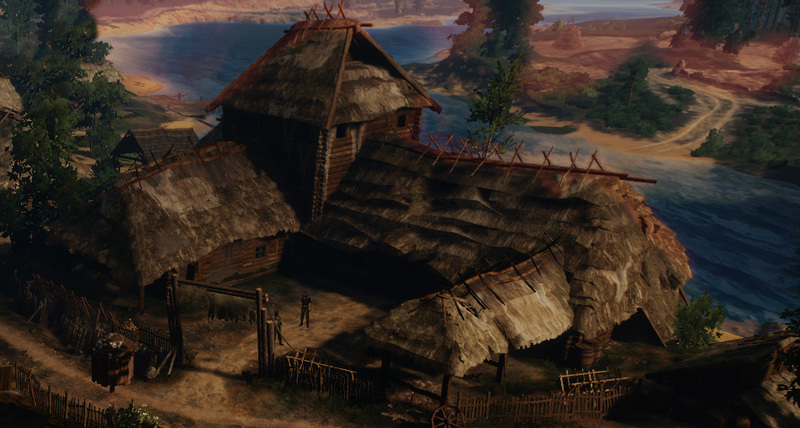 Let Koroth weight their deeds - and ours - beneath a clear sky"
Stalking up the river bank as if he were stalking deer Martel lost slight of his quarry for a moment, but a left turn into some undergrowth gave him a commanding view of the tumbledown yard that sat in front of the lodge. Here he could see the pair of guards better. The two were playing at horseshoes with pitted old shoes they must have found in the collapsed corral, and a small pile of coin suggested that they weren't merely passing the time. Praise Koroth for the vigilance of bandits and deserters. The closer of the two was a young man with short black hair and an equally short scruffy beard, scarcely a few days past stubble accentuating hollow cheeks. He wore a quilted burgundy doublet that looked like it might have once borne livery. The other was completely bald, sour faced and thick set. He wore simpler attire more akin to a woodsman or herder as well as a li[-curling snarl. As Martel closed on them swiftly through a patch of wild blackberries he snagged his chain on a thorn, and before he realized a whole growth of the plant pulled taut and then snapped back in his wake with a distinctly unnatural susurrus of foliage. The bald one's head snapped up and he peered in Martel's direction. "You ere that?" he demanded of his companion, loud enough for Martel to hear. "What?" asked the other man in a sullen tone. "Summit in that thar bush." the bald man slurred, peering closely almost directly at Martel. He leaned down and felt for a spear and axe that lay near his feet, not taking his eyes off the undergrowth. "Prolly a bird or some such innit?" asked the dark haired man, peering in Martel's general direction without much interest. OOC: Okay, so baldy here tied you so he heard... something. You've got a couple of options here. Either another stealth check of some kind to stay put, stay quiet, stay hid, but baldy will get Advantage trying to spot you this time. Alternatively you can just accept the jig is up, pop out and put one in his eye, and hope your aim is good enough to stop his raising the alarm. Otherwise a distraction from your allies might be just the ticket. How are your local bird impressions Smallfeather? Merana remained crouched low, waiting for Martel and Smallfeather to get in position before she would reveal herself to the two men to draw them away from the cabin. As she waited however, she tensed up when all of a sudden she heard the rustling of the bushes that told her one of her companions hadn't been as skilled in their ability to remain silent as they had been confident. Still, there was nothing that could be done about that now. She decided against picking up the bow that she had laid flat at her feet: While a rustling bush might make these bandits wary, she doubted they would remain calm at the tensing of a bowstring. She had placed a couple handfuls of leaves over the shaft, while it was easy to spot once close by, the purpose of it was solely to hide the weapon from view from a distance while giving her the security of having a weapon within reach should the men charge at her. For now however, she heard Martel grunt like a pig, and remained low to watch how that would play out, hand close to where her bow lay in order to lend her assistance should he be discovered. 14:53, Today: Martel Gautaz rolled 3 using 2d6-1d6+1+3. Clever + Alhonian Lore with Backroads Knowledge. It was truly amongst the oddest things Martel had ever done when he looked back on it. In the scrub mere yards for desperate and violent men he rummaged through the leaf matter and snorted like a pig. From Smallfeather and Merana's position the pair could see the dyer's odd reaction and that it was the first thing to spring to mind for Martel was a baffling insight into the man's inner workings. All but the snuffling Gautaz stood stock still for a long moment. "I's a feggin pig ya half wit." snapped the dark haired youth with a derisive sneer as he turned to his companion. "You oughta get yer nerve under control or Herctor'll open yer throat. He don't brook no men as might break when the time comes for mettle." But the bald man was still squinting into the scratchy scrub "Naw" he said, then took a quick step back "I think I can see... I swear I see someone in there" he raised his voice "Show yerself." The young man snorted a mirthless laugh. With the man looking into the bushes, and his companion with his attention on him, Merana decided to do something to distract them from Martel's location. Given that neither was looking at her at that time, she carefully picked up a nearby stone, and lobbed it into some bushes on the other side, making sure to stay low again before it would hit the branches with a rustle. Given that both men believed themselves to be fairly secure here for one to be so dismissive of the other, she figured a rustle on the other side might be enough to draw their attention away. The first man was certainly jumpy enough by now to react to it, all the same. Let them search an empty bush, and in the meantime Martel would be able to sneak away while their backs were turned. If the situation would play out like in her mind, his companion would laugh at him again, the first one would sulk at being made fun of and their level of attention would once again decrease. 18:23, Today: Merana Sabravin rolled 6 using 2+1+d6-d6. Insightful + Strategy. Not counting any bonuses from not having been spotted, of course. The stone sailed toward the path, landing in the undergrowth with a rattling of green wood. The younger man's head snapped to the point of impact with a speed that only a man who has known desperation could muster. "Maybe ye'r not so a fool." he growled, suddenly wary. He reached to his hip and loosed a brass-headed mace with practised ease. His compatriot glanced to the noise, but quickly returned to peering in Martel's direction. His only response was a derisive snort as he himself produced dirk and mace from boot and belt in a cautious moment, before taking a meaningful step towards Martel's hiding place in an effort to command a better view. "A'ight little piggy, come on out thar." the knife-lean youth purred, similarly advancing on Merana's decoy. Claiming the extra Advantage die for the snuffling, but let me know if it needs to be discarded! The sound of crackling undergrowth cut her thoughts short, and she noticed Martel jumping out at the first man, who hadn't given up his inspection of Martel's hiding place. Hissing a curse at whatever had the ill fortune of being near her, she nocked an arrow on her bow, but held it horizontally as opposed to vertically -- even in her anger, she knew enough not to stand up and broadcast her hiding place, as to the guards it was still unknown. She then remained silent on the ground, bow slowly drawn, waiting for the reaction of the other man to his friend being attacked. It was a surprise for him, more than it was for her, to have seen Martel jump out of the bushes, and she was unsure how he would react. And so, she kept her arrow aimed at a point between him and Martel's fight, so that when the man decided to charge what in his eyes was a single combatant, she would be able to guide her target and hit him far more efficiently than now when he was standing still, but might react at any second. As it would give away her own position, she needed to make the first shot count. Even on a miss it would still be beneficial as it would interrupt the man's charge, and force him to pause, which would give Martel more time to finish off his opponent before facing a second. She hoped Smallfeather would not be boasting about those throwing blades of his. 19:06, Today: Merana Sabravin rolled -1,3 using 2+1+d6-d6,d6. Insightful + Strategy. -1 if i don't have the extra die for being hidden, 3 if i do. With a clattering of undergrowth Martel sprang from the undergrowth, and though he was half expecting attack the bald-pated man was a step slower than the lunging dyer. He knocked Martel's thrust aside with his dirk, but the parry was far from clean and it tore open the soft leather armour up his arm. In swift riposte he brought the mace around toward his assailant with a savage grunt. Merana was less fortunate. Holding the bow at so odd an angle she was entirely unable to draw a line even to a waiting target, and her arrow sailed over the bearded man's shoulder and clattered into the yard behind him, landing haphazardly on its side and bouncing. In response his head whipped around and for an instant Merana caught a glimpse of the savage desperation in his hollow eyes as they grazed her hiding place. OOC: For OOC purposes we're calling these charming gents Baldy (+2 Strong, Tough and Willful, club, dirk and formerly leather armour) and Beardy (+2 Fast, Clever and Perceptive, club and leather armour). They're both Bandit Practitioners (see here). Baldy's defence was a 3 against Martel, meaning a difference of 6 points. I believe Martel found a sword (I'm assuming a generic one) and an arming sword has DT of 4 (see here), so a 6 point difference means 1 point of damage, which did 1 tier of damage to his leather armour (see here), which renders it useless until repaired. He's now counter attacking with a +6. Merana's guy needed a 4 to be hit - he was on alert - so even with advantage her shot went a little wide. He's now trying to spot her with a +3. This message was last edited by the GM at 03:20, Wed 21 Nov 2018. Seeing her shot miss, Merana knew she still held the advantage. Even with the bandit aware of her presence, she knew he would be VERY unlikely to walk in the shot's direction and practically invite an arrow in his chest. More importantly, she knew he most likely realized this as well, so the most likely thing for him to do was to immediately head for cover and circle around to where he thought the shot had come from. And yet, with Martel jumping out of the bushes, odds were he did not trust that tactic either. She did nock the next arrow though. Even with the bow in an unfavorable position, she knew that as long as she was not spotted, she could keep the bearded man from crafting any sort of strategy beyond 'hide behind something solid', but on the off chance he would try to beat the odds and charge her, she wanted to be prepared for that. For now, she would leave the man with a sense of urgency all around, and only guesswork to base his next moves onto -- mistakes would be made soon enough under those circumstances. She would just need to keep a cool head to ensure it would not be her making them. OOC: Believe he still has a +3 (+6 - Martel's +3) and hence probably strikes? 14:40, Today: Martel Gautaz rolled 4 using 2+1d6-1d6. Clever+Athletics.